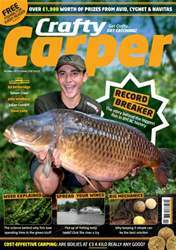 This month's cover star Ben Hunt breaks the record for the largest fish caught in the British Young Carpers' Angling Championship, while the 2015 champion Dan Price is introduced for his first feature within Crafty. Jake Wildbore heads off in search of nomadic river carp, Simon Crow looks at target selection and Ed Betteridge talks about how he manages to combine both family time and fishing time in one. We've also got over £1,900 worth of competitions with prizes up for grabs from Avid, Cygnet and Navitas.